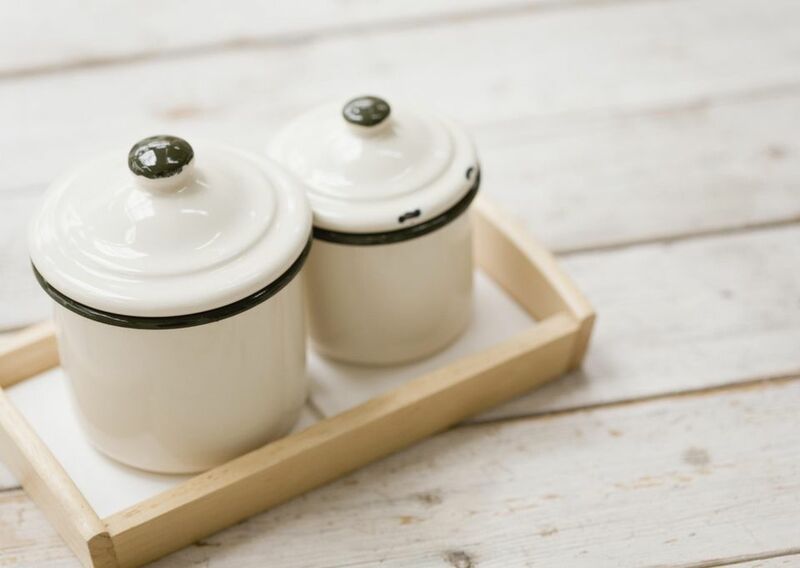 Find some old canisters in your cupboards or pick up some gently used canisters at a garage sale or thrift store? I’ve found my fair share of canisters second-hand or passed down from family members. They’re not always in the best shape, but they come in handy. Instead of passing up a bargain, clean up old canisters and add a bit of personal touch to them with paint, stencils, decoupage, ​or glitter. Put your creativity to work to transform those used canisters into storage solutions for your kitchen, bathroom, office, garage or any other room in your home. Think of what you want to store in your canisters and where you want to display them. After you reconcile what you already have and think about how you want to put your canisters to use, refurbish them to make them your own. Cover the canister with chalkboard paint to create a universal storage container for just about anything. Use chalk to write a description of the contents or to place a name on the canister. To change the label, simply wipe off and write something else in chalk. You can do so much with paint. Be as creative as you’d like – even get the whole family involved! As a note, be careful what kind of paint you use if you will be storing any kind of food items in the canister. To be on the safe side, look for non-toxic paint or don’t get any paint near the inside of the canister. Using stencils can help you create even and articulate labels or artistic designs and patterns for your canister. For easy application, look for self-adhesive stencils that you can use with paint or etching cream. Stencils can help you create personalized canisters for family members or label per the contents of the container. Want to add a little something more to the canister? Look for pattern and design stencils, such as flowers, shapes, animals, etc. Applying fabric or colored paper is an easy and fast way to transform old canisters. If you’re not using the canisters near water, such as next to a sink, cover them with leftover pieces of fabric, scrapbook paper, tissue paper or any other decorative medium that can be easily applied with craft glue. Think of how you want to lay out and cover your canister and then measure and cut your fabric or paper. Apply the fabric or paper to the outside of the canister with craft glue. To seal your decoupage design, apply a layer of craft glue on top of the fabric or paper. After the glue completely dries and you are happy with your design, place a label on the canister, such as a homemade label made of paper or a store-bought sticker. To add an extra sealant to the label, apply another layer of craft glue or acrylic sealant spray over the label. A quick way to revamp old canisters is to apply glitter to the outside. This is a great idea for a child’s room or to use as holiday décor. You can paint the canister first, if you’d like, or simply apply craft glue to the outside of the canister and sprinkle on your choice of glitter. To keep the glitter in place, apply a coat of acrylic sealant spray or a second coat of craft glue. If using the canister to store food items, such as cookies or candy, be careful not to get the glitter inside of the canister. If you do get glitter inside of the canister, thoroughly clean it out before using or line the inside of the canister with tissue paper or fabric.